In this section you will learn how to rank any business in Google TOP10 even if they don’t have a website using Google Maps/Google Places (now Google Plus Local). Google Plus Local (Google Maps/Google Places) captures 50% of real estate in Google TOP10 for any local search. 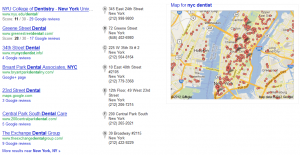 Being listed in Google TOP 3 local results for primary keywords that people use to find the business (“NYC dentist”, “Bethesda chiropractor” “Austin lawyer”) means constant stream of customers and phone calls. Any business owner would be thrilled to see their business listed there and gladly pay you if you could help them get top spot in Google. This section will show you step by step instructions how to achieve Google TOP3 rankings for local business searches using Google Plus Local, the best part – you can do this for any business across the globe. If the business does not already exist in Google Places then DO NOT register it yet. The first thing you want to do is build CITATIONS which reference the business name, address and phone number. After citations are built then register your business on Google Places. If the business is already registered or listed in Google Places then no worries… Just continue to STEP 2. Make sure the format of your business name, address and phone number is always EXACTLY the same across all citation sources. Make sure all citation sources MATCH the format on your Google Places Page. Make sure that all of your citations are submitted using EXACTLY the same format. Don’t use “Smith’s HVAC & Plumbing” on one citation and then “Smith’s HVAC and Plumbing” on another. Don’t use (818) 555-1212 on one listing and then 818-555-1212 on another. Don’t use “1234 S. Trueluck St.” on one listing and then “1234 South Trueluck Street” on another. Always make sure the format is exactly the same every single time. Your next goal should be to get the 5 Star Rating graph to appear under your business listing. The reason behind this is simple; Social Proof like this increases conversions. More people will call you and more people will click your listing vs. others who don’t have the start ratings. How do you get a Star Rating? You need to have at least 5 reviews indexed by Google. The reviews could be directly on the Google Places page or they could be incoming reviews from popular citation sources like CitySearch.com and Yelp.com (or many others). One of the options to get good reviews is to ask best, most frequent, loyal customers to logon to their Google account and leave a review at your Place Page. Another option is to ask your new customers that enjoyed transaction to leave good review, this could be as simple as administrator reminding them “We would really appreciate if you could leave your opinion on our Google Plus page”. You need to make your Google Places listing as complete as possible. Add a good description but stay away from keyword stuffing (you’ll get suspended). Choose 2 or 3 good categories for your business and upload 10 pictures. Add your website and email address to your listing as well. Last but not least you’ll need a video to make your listing complete and then you’ll need to market that video by submitting it across popular video hosting websites like YouTube. If you’re still not ranked in the top 3 then continue adding Reviews (not only in Google but in other places like Yelp as well) and Citations. As with anything in life, too much of a good thing too fast can actually harm you. Don’t go out and get 100 reviews in 24 hours… It’s not natural. Google Place Page rankings are much easier to achieve if you have a process to follow. If you continually work to build citations, references and reviews, your business will achieve results, not only from Google traffic but from traffic coming from all over the web and mobile apps, 411 directories, etc. Google+ Local is giving local businesses massive exposure and putting them in front of people that are searching for their products and services… Local businesses are projected to spend $28.5 Billion in 2012 and $32.5 Billion in 2013 on online marketing so if you want piece of that pie you need to take action right now. Now that you know how to rank any local business in Google go get customers that would be happy to pay you $500-$1500/month using this strategy.